My wi se friend, and creative life coach extraordinaire, Jamie Ridler, once said to me: “There is something to celebrate everyday. Let’s not get so busy looking at what’s ahead of us that we forget to celebrate our accomplishments today – both big and small.” I think of these words often, especially when it comes to celebrating the smaller moments of life. Often we associate the word celebrate with big events – such as birthdays, holidays, occasions – or with major milestones, such as getting a promotion, or signing a book deal. 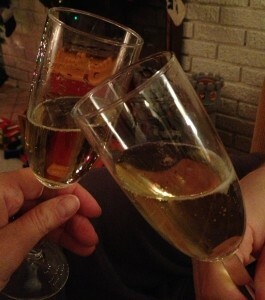 Of course, all of these happenings do deserve a celebration, and I’m always up for a champagne toast! But I think it’s equally, if not more important, to celebrate the daily moments, the smaller happenings that contribute to our happiness. Because it is the smaller moments, the everyday actions that allow us to arrive at the “bigger” events. What if we approached each day with a celebratory nature, a readiness to applaud ourselves and others for a kind action, for changing a thought pattern, for just being here, for being alive and breathing. It may not be a mindset that we can maintain at all times, but perhaps it can shift our thinking on those difficult days. Today, I’m celebrating the fact that I finally tackled a to-do list I’ve been putting off (man, it feels good! ), that I have carved out time for yoga and meditation in my workday, that my kids and I are healthy again after a month of crazy sickness in the household. Looked at individually, these may not seem like momentous things, but as I am reminded of so often, gratitude in small things can alter your view of the world. What are you celebrating today? Congratulations! I’ll raise a virtual glass to you.